President Trump is in the news again (of course! ), this time for issuing a controversial pardon of former Arizona sheriff Joe Arpaio. Arpaio had just been convicted of criminal contempt for knowingly violating a court order requiring his office to stop targeting Latino drivers — a misdemeanor that carried a maximum sentence of six months in prison and a fine. Less than a month after the conviction, and before Arpaio was formally sentenced, President Trump pardoned him and has explained that he felt that Arpaio was treated unfairly. The pardon has been strongly criticized by a number of groups, and polls show it isn’t very popular with the American people. The power to pardon is one of the most interesting, unilateral, and absolute powers possessed by the President of the United States. It’s also one of the powers that is most likely to provoke criticism — except when the President uses that power to pardon the turkey presented to him for his Thanksgiving dinner. Through the pardon power, the President has the ability to override the decisions of the judicial branch of government and of prior administrations who decided to prosecute the individuals who are pardoned. The President’s power to pardon was first established by George Washington, who pardoned two men convicted of treason and sentenced to hang for their role in the Whiskey Rebellion, and over time it has been institutionalized — and used in ways that appear to be unseemly. President Clinton’s last-minute pardon of fugitive Marc Rich, who had been indicted for racketeering, trading with the enemy, and evading income tax and then fled the country for 16 years, was mired in allegations of intrigue, back room deals and campaign contributions that made it look like the pardon power was for sale to the wealthy. Trump’s pardon of Arpaio is unusual, for coming so soon after Arpaio was convicted and so early in Trump’s term in office. Because the pardon power tends to be controversial, Presidents typically wait until the end of their term in office, as President Clinton did, to issue pardons, so they can’t be held accountable by voters. Trump also acted without following the advice of the Department of Justice unit that has been established to review and recommend pardons — but of course that is the President’s prerogative, as President Washington established more than 200 years ago. The ability to pardon puts a tremendous amount of power in the hands of one man. With President Trump’s mercurial temperament, we can reasonably expect to see that power used in new and different ways while he remains in office. At least Trump acted in a way that will allow voters to consider his pardon decision as they decide whether to vote for him, assuming he chooses to run for reelection. And who knows? With President Trump being who he is, perhaps he will break with precedent on that turkey pardon, too. The Wrestling Fan and his lovely wife recently spent a few weeks hiking around Turkey. He returned from his travels with a gift for us — a blue pendant with an eye-like set of concentric circles on the front. Called a nazar (in Turkish, the Nazar Boncugu) the little pendant is supposed to serve as a kind of good luck charm that can protect you from the ravages of the “Evil Eye.” The notion that people can give you the “Evil Eye” — whether through witchcraft, or sorcery, or deviltry, or simply through the sheer force of outright, pulsating human envy and hatred, that certain people can hurt you with a glance — is one of the oldest superstitions known to homo sapiens. And that superstition still has legs. 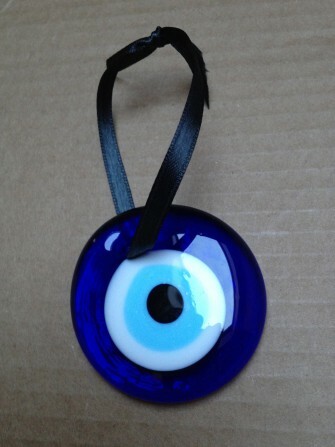 According to the WF, this little blue pendant is the most popular souvenir in Turkey, sold and seen everywhere. It was nice of the Wrestling Fan to get us some protection from the Evil Eye. But now we are faced with a true quandary: where do we most need this important personal shield? It would be great to have it at the office, where I probably could use every bit of help, from any source, in resisting the depredations of opposing parties and counsel. However, I don’t want to hog the protection. You never know when Kish might need the nazar on the homefront, to fend off the evil antics of slow-moving service providers. And for that matter, maybe it’s greedy to keep the nazar to ourselves. Let’s face it — the entire city of Cleveland could use a Nazar Boncugu to help one of its sports teams finally win a championship one of these years. Now that I think about it, I wish the WF had packed a few more nazars into his suitcase. About The Wishbone . . . .
At countless Thanksgiving dinner tables today two people will be designated to grasp the two ends of the wishbone, think of a wish, and pull — and whoever ends up with the bigger part of the bone is supposed to get their wish. It’s an ancient practice, one that dates back to long before the first Thanksgiving near Plymouth Rock. It goes all the way back to the pre-Roman Etruscan civilization, which used chickens to tell the future — and started the practice of focusing on the furcula, which is the proper name for the wishbone. The Etruscans, gentle souls that they were, stroked the dried wishbone as they made their wishes for the future. Leave it to the Romans, and their competitive ways, to decide that the Etruscans were right to focus on the furcula, but were wrong in how they treated it — and that the best way to get a wish granted was to break the wishbone in a contest that ensured there was a winner and a loser. And as the Romans conquered the world, their bone-breaking tradition was borrowed by other cultures, including the inhabitants of the remote island outpost of the empire, who — centuries later — shipped it across the Atlantic to the New World. Much as we might admire the Etruscans and their views on avian divination, if you’re offered the wishbone today, I suggest taking a firm grip and yanking for all you’re worth. For many of us, Thanksgiving is rich with family traditions. Whether it is food, decorations, or the timing of the big meal, the traditions connect us to earlier times and people who are no longer with us but whose spirits live on, undiminished, in our memories. The traditions are a big part of why, for many people, Thanksgiving is our favorite holiday. Recently Mom and the five Webner kids had dinner and reminisced about Thanksgivings of days gone by and some of the traditions that prevailed during our childhoods. Mom putting little wax candles of pilgrims and turkeys at every place setting at the Thanksgiving table. A large cardboard representation of a big-breasted tom turkey with deep red wattles on the front door to greet our guests. Native American headdresses made at school from construction paper, each ersatz feather a different bright color, and from the younger kids drawings of turkeys made from the outlines of their hands. A cornucopia centerpiece surrounded by riotously colored, warty gourds. My father, as much of a turkey fiend as the Dad in A Christmas Story, carefully carving the bird and happily munching on pieces as he went along. Uncle Tony lecturing us that we were really missing something by not eating the heart and liver. A heartfelt prayer for the year’s blessings and the food we were about to enjoy. Gramma Webner announcing the turkey was too dry. A tube of cranberry dressing, still bearing the corrugated impressions of the can from whence it came, lying on its side on a plate and sliced to form perfect wine-colored circles. A huge bowl of Mom’s hand-mashed potatoes, doused liberally with her thick, homemade gravy. A mincemeat pie. Football throws outside on a crisp autumn afternoon to help stimulate the appetite for the feast to come, and sprawling on the couch watching football on TV, groaning at the amount of food consumed but still somehow finding room for a late-night turkey sandwich and a final piece of pumpkin pie and whipped cream. If you’re going to deep fry a turkey this Thanksgiving — and enjoy all that moist, succulent, juicy deep-fried goodness — please pay attention to William Shatner. And for God’s sake don’t do the deep-frying near a cheap plastic lawn chair!